So i didn't actually wear this skirt today, because i would of frozen to death, but i after finding it at the back of my wardrobe i thought I'd bring it out for some photos. I've teamed it with a blue Primark jumper which i have also have in this colour & this one. I was taking some nice photos, then got a bit giddy and decided this pics were too silly to not use. I also have straight hair for the first time in months, which has made me realise just how much it needs a right good cut. Must sort that out in the new year! Myself and Matt decided to to the rest of the Xmas shopping, well in Matts case actually start it. I wanted to get in to town and back nice and early so we missed all the manic shoppers. I actually woke up at 6am so getting myself sorted wasn't that difficult this morning! The post office was empty, and we manged to get in and out of the shops in less than 3 hours. Just as it started to get busy! I'm so impressed and so very happy. All the Christmas Scrabble orders have now been sent, but I'm still taking ones for after Christmas. After working it all out and realising just how many scrabble tiles i actually have i've manged to drop the prices, so massive yay all round! We had about an inch of snow last night, so it wasn't a great amount, but it seems like a good enough reason to stay indoors and do nothing. Matt had all his deadlines yesterday, so this afternoon we've decided to just major chill out, watch films, eat rubbish food and will probably play the playstation. I'm going to try so hard to get some uni work done this week, but i can tell you now I'm already in total Christmas holiday mode. Roll on Thursday, because then ima coming home! Ooh, you look so cute in that skirt (: Your hair looks really nice straight too. Oh god, don't remind me. I haven't finished my shopping yet :/ Ooh, I hope you have a lovely chilled out day. I'm certainly doing the same! Oh wow I love your hair straight. It looks very sleek. Also loving the outfit, its so fun and cute, the photo's are adorable too! Really lovely skirt, it suits you so much! that skirt is so fun and fresh! I love, love, love that skirt!! How clever getting up early to beat the crowds, I'm too lazy/disorganised to do that, though I think I have nearly all of my shopping done! You're chill out day sounds perfect, Mark has exams after Christmas so his days are spent studying, I get slotted in for evening attention! Supposed to be going out tonight but the snow might mess that up, wah! 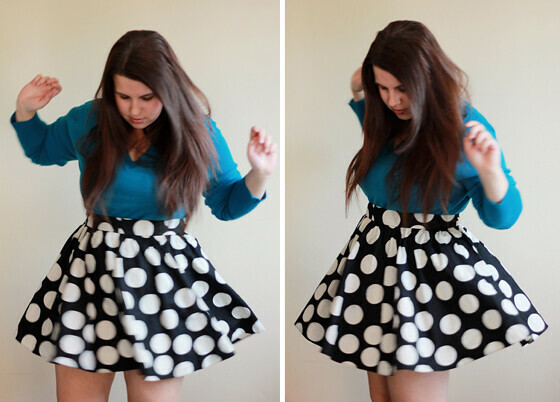 Love the skirt twirling pictures. Gorgeous skirt :) the jumper is such a lovely colour too! Well done on getting your xmas shopping done- weight off your mind now. I hate going into town at the moment, its awful- so early is a good idea. You look lovely, great pics! Aaah I do love it when a shopping day goes well! Yay for going home! Hopefully I'll be doing the same tommorow, although that's weather dependent ofc! You look so lovely in movement shots! I think this is a nice departure from your more static poses. Congrats on the Xmas shopping. It is so hard to get homework done around Christmas time, can't blame you! I love the bright blue with the polka dots! You are adorable! I love that skirt, it's so beautiful. polkadotsss.. love love love it! super pretttyyy! ha, imagine wearing it in the snow! LOL. least you can bust it out in spring!! I saw a girl wearing a mini with NO TIGHTS and ickle wickle boots yesterday! Eurgh. made me shiver.